In this episode Nevin Bansal; Business advisor, Creative thinker, and Father (of two) shares How to Build a Socially Conscious Brand That Others Admire! After the tip, we go backstage and learn how Nevin, Became a Magnificent Mentor, Won real big in Vegas, Has a best friend for life and more! My name is Nevin Bansal, founder and CEO of Outreach Promotional Solutions, and today I’m gonna talk about how to build a socially conscious brand that other admire and want to do business with. So, in order to build a socially conscious brand, first you need to figure out what does your company stand for? What are the things that your company cares about? And how do you want your brand to be perceived by your customers? Do you have specific causes that you care about? Do your employees care about certain causes or community initiatives? For example, you might think about the nonprofits and community causes that you care about. You might also think about the values that your company stands for. That could be trust, community, philanthropy, partnership. All of those things are gonna help you identify the type of brand name that you want to portray to the community. So next, you want to really align your people and your company around the actions that are gonna help you reinforce the socially conscious brand you’re trying to build. For example, maybe you want to integrate community volunteering with your team. Maybe you want to contribute to a nonprofit, sponsor a fundraiser. All of these types of things are gonna help you really reinforce that community brand you’re trying to build, and really align your companies actions with the socially conscious brand you’re trying to build. So next, while it’s great to do great things in the community, it’s also very important to promote your efforts in the community so that you can build your brand. You can utilize social media to post pictures of your volunteering efforts, to share what you’re doing with different events and nonprofit organizations. You also want to take advantage of branding opportunities. So if you’re sponsoring a 5K, or a gala, you want to be able to make sure that your brand is emphasized in those events, and that you’re marketing your efforts in the community. And finally, it’s so important that you’re consistent in your efforts. It’s not enough just to volunteer one or two times, or to maybe sponsor one event. In order to have your brand live a socially conscious lifestyle, it has to be able to be reinforced over and over again through consistent volunteering, consistent partnerships, consistent community efforts. That’s the only way you’re really gonna build that socially conscious brand. Following this approach, you’ll start to build a socially conscious brand that others admire and want to do business with, all the while doing great for the community. products and services that help companies grow and promote their brand. 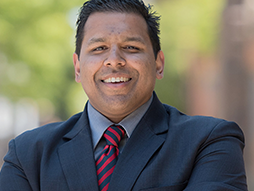 Click here to find out more about Nevin Bansal.